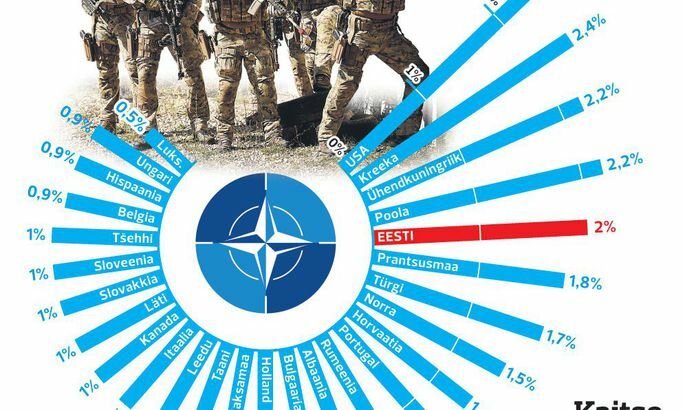 Though members of NATO pledged last fall to increase their defense spending to 2 percent of their gross domestic products by 2024, it is unrealistic to assume that this goal will ever be reached by all 28 allies, says Carnegie Europe head Jan Techau. Meanwhile, the metric still carries value, says Mr Techau in analysis «The Policy of 2 Percent: NATO and the Security Vacuum in Europe» prepared for 1st anniversary of the summit. The Carnegie head said Europe has been debating for two decades how to fill the vacuum due to the pulling back of Americans. The Ukrainian crisis laid the problem barer than ever before. «Who will take care of European security when America will be likely to carry a smaller share of the load?» he asked. As the report by Mr Techau was introduced in Brussels, US Ambassador at NATO Douglas Lute was present. The American underlined that the 2 percent requirement is good as otherwise the defence spending of nations is incomparable. Mr Lute said that while the metric was not invented in Wales, Newport still became the place where all allied heads of governments and states gave the promise. The American was also optimistic that though it is only five of the allies that keep the 2 percent pledge, a whopping 21 have stopped shrinking their defence budgets at long last – according to this year’s data. Meanwhile, Mr Lute was disappointed that Americans set up 70 percent of the total NATO defence budget while the others put together yield mere 30. He reminded the listeners that in addition to article five the treaty does feature the article three, prescribing that each member take sufficient domestic measures to defend themselves. Seated next to Mr Lute and Mr Techau, Malcolm Chalmers of the British think-tank RUSI the report was exaggerated regarding the extraordinariness and scope of the situation. Mr Chalmers said it is not good to explain the gaps by claiming some states are more generous and think more about the common good. «This is the result of our varying defence policies,» he said. Also, Mr Chalmers underlined that the larger numbers behind the British and French defence spending are the nuclear arms costs. As no other European state will probably get nuclear weapons, why expect them to boost defence spending in like scope. Also, the British analyst thinks it unlikely for Germany to suddenly turn into a nation doing an abundance of foreign missions. «I do not believe that we will see a large amount of nations currently below 1.5 percent who would near-term be moving towards two percent, as national priorities do not change radically,» he predicted. So what did the leaders actually do [at Wales summit]? They gave their signatures (to joint declaration), that’s what they signed. There were no intermediaries. They were all present. The lights were on. It was read out very plain, and they signed the following: that all 27 agree to torn the national defence cuts trend and during a decade move towards two percent of GDP. Nobody guessed it would happen overnight, did they? On top of that, they said that within the two percent they promise 20 percent as capital investments. Meaning: investments into equipment. Not into human resources, not operations and maintenance, but for new equipment. So it was two percent and 20 percent. Essentially, this is a promise. I believe many of you know that after the summit [the British Prime Minister] David Cameron turned rather vague about for how long the UK would stick with the two percent. Diplomatically, this was not to UK benefit. Lots of UK government officials – both military and civilian – had lots of highly uncomfortable meetings with American diplomats and leaders in Washington. I’ve heard lots of recollections of these meetings from Newport (Wales – edit) summit till today. This July, the UK Treasury promised real defence budget increase of 0.5 percent a year till the end of the decade. Also, it promised to fulfil the NATO two percent pledge till the end of the decade. Also present in the back room while the transatlantic declaration was in preparation, wherein we put these two percent, and it was a very interesting development. One thing we kept getting stuck in was obviously the issue of how we would enforce these magic numbers. We have an alliance of independent nations, with their independent budgets and tough finance ministers, and we lack any enforcement mechanisms the way EU seems to have now developed regarding coercive measures concerning EU member states’ budgets.